SGHS senior Gavin Bevan (17) dives into the end zone during the second quarter of the Rebels’ 35-7 victory over Miller on Friday night in Mercerville, Ohio. MERCERVILLE, Ohio — Despite a slow start, the Red and Gold finished the night in decisive fashion. 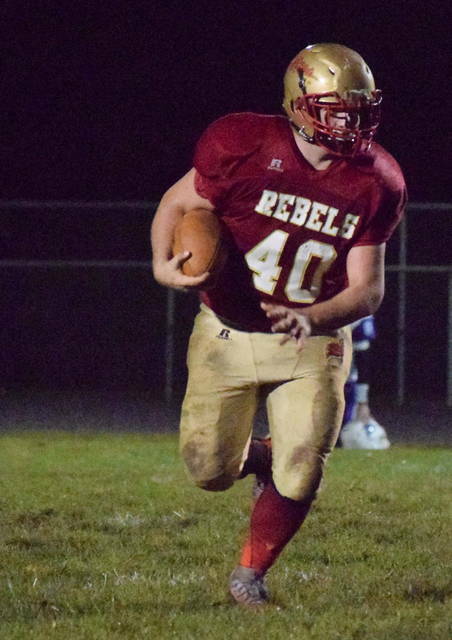 The South Gallia football team trailed visiting Miller 7-0 through one quarter of Friday night’s Tri-Valley Conference Hocking Division contest in Gallia County, but the Rebels rallied for 35 unanswered points en route to a 35-7 victory. The Falcons (2-6, 1-5 TVC Hocking) flew to an early seven-point advantage when Kylan McClain hauled in a four-yard pass from Colby Bartley to close out a eight-play, 65-yard drive with 5:51 remaining in the first period. The Rebels (3-6, 3-4) answered at the 11:19 mark of the second quarter, as Gavin Bevan’s two-yard scamper capped off a nine-play 70-yard drive narrowed the margin to 7-6. Kyle Northup followed with a successful two-point conversion to propel SGHS to an 8-7 advantage. South Gallia tacked on its second touchdown of the contest with 0:02 remaining in the half, when Tristan Saber connected on a 48-yard touchdown pass to Northup. Justin Butler provided a successful two-point conversion with a catch to widen the margin to 16-7. Following the intermission, the Red and Gold furthered its lead to 22-7, when Jeffery Sheets provided a 16-yard rushing touchdown with 8:33 remaining in the third period. The Rebels accounted for all of the scoring in the finale, as Northup scored his second rushing touchdown with 11:28 left in the contest, while Saunders punched in a six-yard run 8:39 later to extend the host’s lead to 35-7. South Gallia claimed a 17-11 edge in first downs, as the Rebels were penalized 13 times for 95 yards. WHS was conversely flagged 10 times for 100 yards. Both squads each had three turnovers apiece, as SGHS tossed two picks and lost one fumble in the contest. In contrast, the Falcons threw three interceptions in the game, as South Gallia’s Saunders snagged two, while Jared Ward pulled in one pick. There was a total of 684 yards of total offense in the game as the Red and Gold claimed a 365-136 advantage in rushing yards, while the Falcons finished with a 106-79 edge through the air. A pair of Rebels surpassed the century mark on the ground in the contest, as Northup paced the SGHS rushing attack with 171 yards on 17 carries, followed by Sheets with eight carries for 102 yards. Tristan Saber finished with a 4-of-9 passing performance, including one touchdown, for 79 yards. Three different Rebels players caught at least one pass, as Northup led the way with one catch for 48 yards, while Sheets had two grabs for 17 yards. Jacob Birtcher rounded out the totals for the SGHS receiving corps with one catch for 14 yards. Following the game, SGHS first-year head coach Mike Smith was pleased with his team’s effort — particularly that of his offensive line and blocking. “Offensively, I thought we did a great job on the line,” Smith said. “Especially in the second half. I think we blocked a lot better following our halftime adjustments. We’ve continued to improve throughout the season. Hopefully, we can come out next week and close out the season with a winning streak. The victory for SGHS snaps a two-game losing streak to the Falcons. South Gallia also improved their all-time record against to 10-9 with the triumph. The Rebels close their 2018 campaign next Saturday as they host Gallia County rival River Valley.